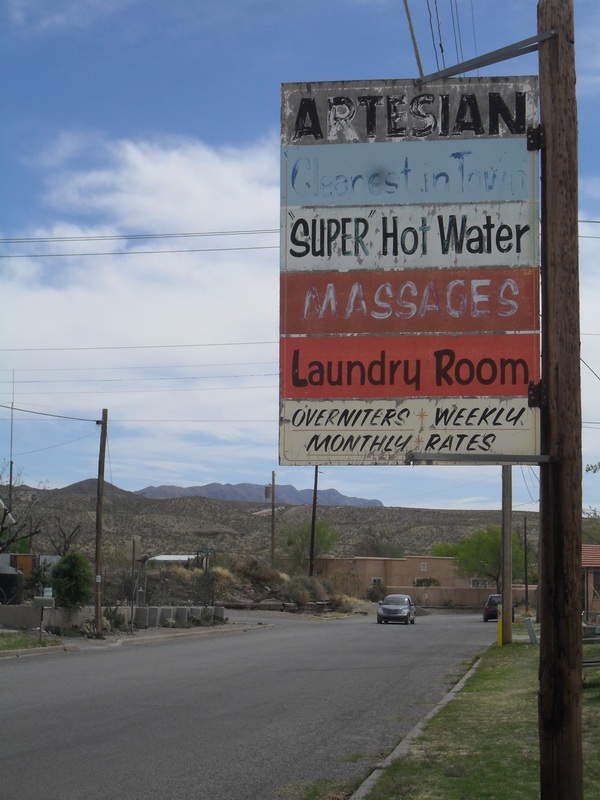 In a previous post, I wrote about my experiences at four bathhouses (Blackstone, Indian Springs, La Paloma, and La Paloma Too) in Truth or Consequences (T or C), New Mexico. 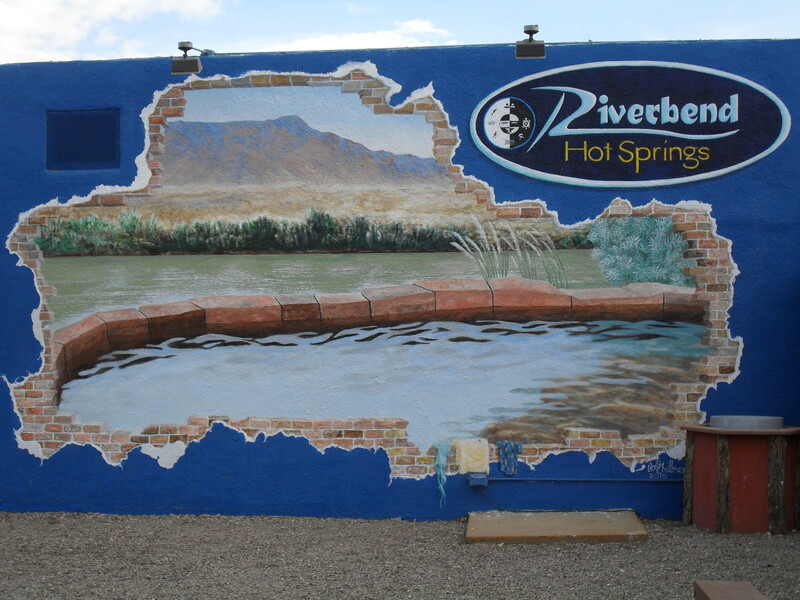 In this post, I will share my experiences at three more bathhouses I’ve visited in T or C.
I soaked at Riverbend Hot Springs (100 Austin Street) once in March of 2014. Riverbend has both public and private pools for soaking. The public pools consist of five pools that cascade from one to another, creating a different temperature in each one. Temperatures usually range from around 100-108 degrees. They are situated around a shaded river deck and include a cold shower for cooling off, as well as our large shaded patio with chaise loungers, mist fans (in the summer), dining tables and chairs, and our barrel sauna…The cold and clear Rio Grande River is also accessible for swimming at your own risk (closed when the river levels are fluctuating). 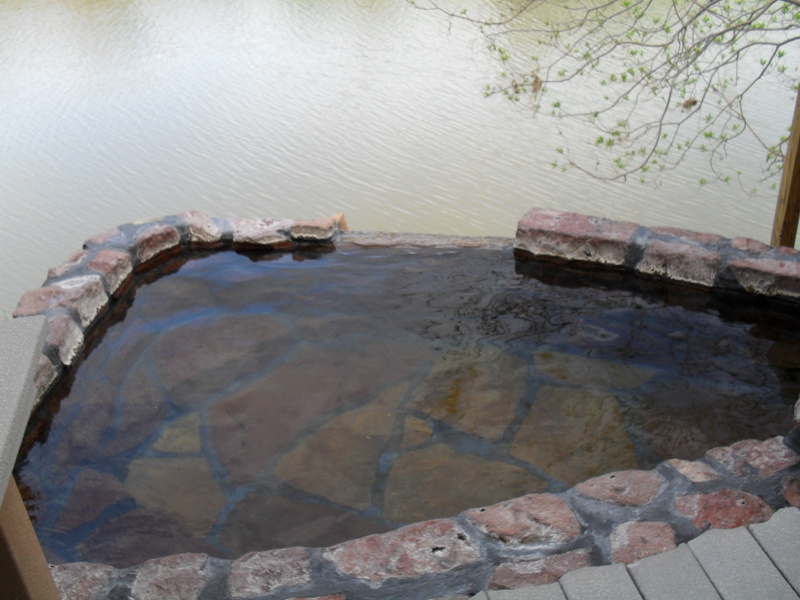 Our private pools are perfect for those that desire to bathe au natural or would like more peaceful privacy. They are walled on three sides but open to the riverside mountain view. Each have their own river deck, cooling mister systems and reclining lounge chairs or benches. They are available for rental by the public and are discounted for overnight guests. I soaked in the Rio pool. Rio (“river”) is very popular for its extremely close proximity to the river, its high temperature, and its quiet flow of water. This cozy pool seats two people very comfortably and has a temperature of about 107-108 degrees. It has a small shaded deck for cooling off between dips. Here’s a view of the deck from the pool I soaked in. The water in the pool was nice and hot, and the pool was deep. I enjoyed being outside naked, and I enjoyed the view. Since most of the soaking in T or C is done indoors, in bathhouses, soaking out in nature was a real treat. However, even though there was a wall between my soaking area and the one next to me, I could clearly hear the voices and follow the conversation of the men in the next pool. Hearing other people’s inane conversation was less than relaxing. Soaking in the public pools at Riverbend costs $10 per hour. 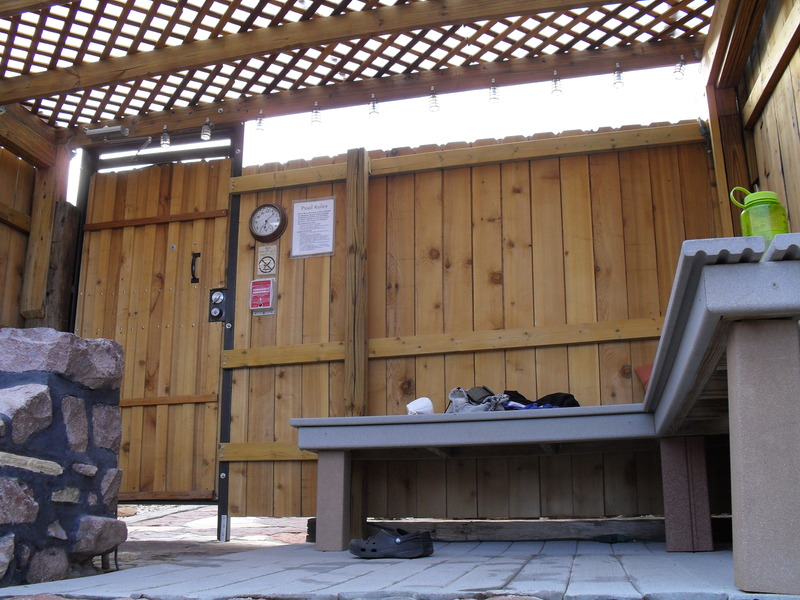 Private soaks cost $15 on a walk-in basis and $10 for overnight guests. Reservations are taken for private soaks. This is the view I had while I soaked in the Rio pool at Riverbend. 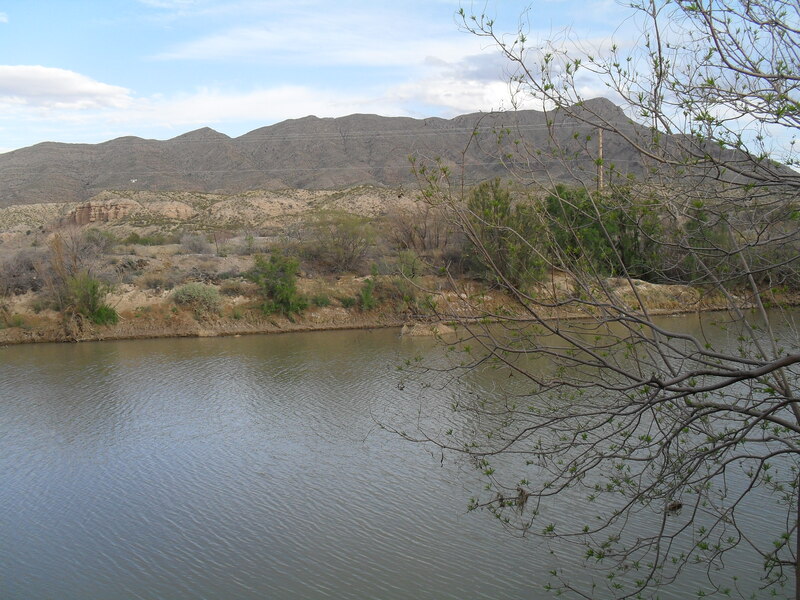 That’s the Rio Grande in the forefront. Turtleback Mountain is in the background. 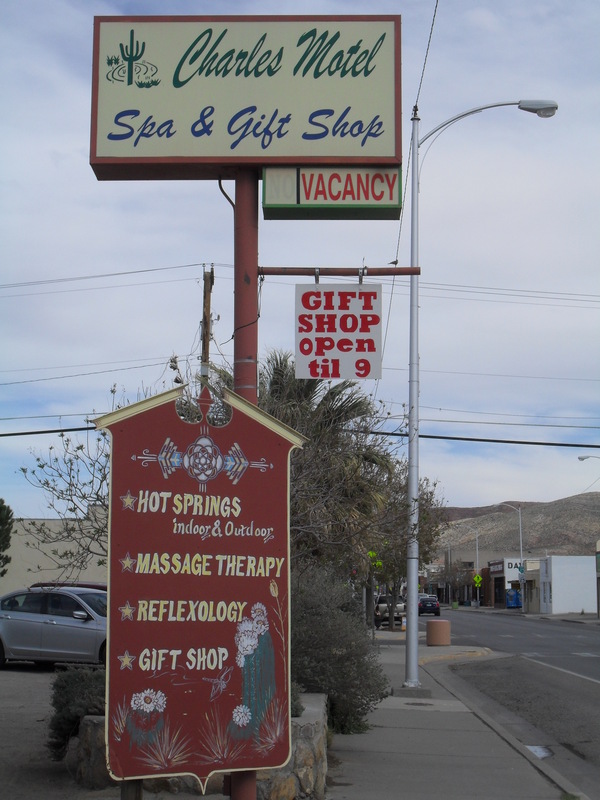 I’ve soaked many, many times at the Charles Motel and Hot Springs (601 N Broadway Street), the first time in March 2014, most recently in December 2015. At the Charles, there is a women’s side and a men’s side, both with individual tubs (much like conventional home bathtubs with faucets and drains) for soaking. I’ve only ever been on the women’s side, so that’s what I will write about. Also, the Charles offers soaking in outdoor, rooftop Jacuzzi tubs, but I’ve never soaked in them or even been on the roof to look at them. The photo to the left shows the women’s side. Each tub is in its own little cubical, separated on two sides by walls that go almost all the way to the floor and a curtain in the back. There is drinking water available to anyone soaking. While the walls and curtains offer visual privacy, they don’t do much to block sound. Sometimes women soaking in tubs next to each other want to chat, which makes for a less than relaxing experience for people like me who want to soak in silence. I’ve found that the best time for me to soak at the Charles is first thing in the morning, as soon as it opens at 8am. I’m usually the only person soaking that early in the day, and the whole area is blissfully peaceful. This is my favorite tub to soak in at the Charles. It’s shorter than the rest, which is ok since I am short, and it’s deeper than the other tubs too. I like deep! I also like the pink and blue tile. Temperature [in the baths] ranges from 98 ° to 115 °F… All our tubs are drained, cleaned and sanitized after each use. 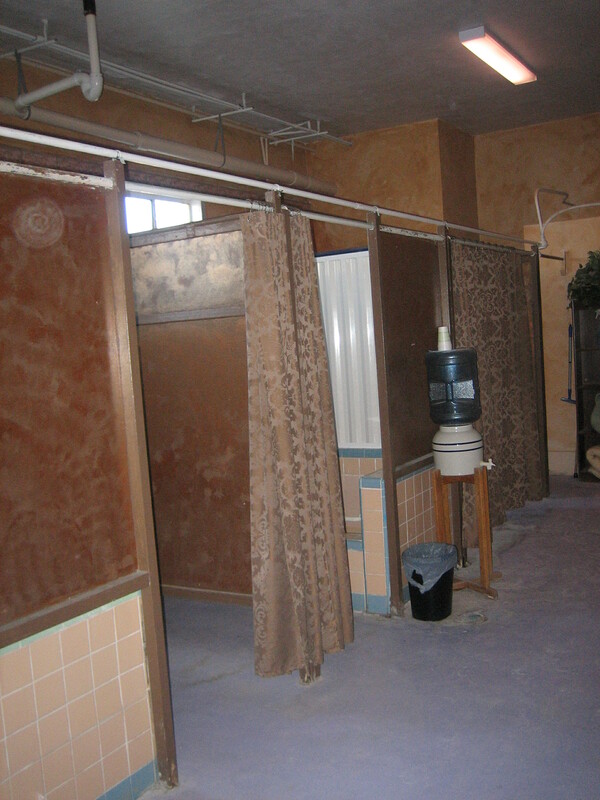 Of all the places I’ve soaked, The Artesian Bath House and Trailer Court (312 Marr Street) is probably my favorite. I first soaked there in March of 2014 and most recently in December 2015. Like at the Charles, soaking is done in tubs much like those in the home, tubs with faucets from where the water flows and drains through which the water exits. Unlike at the Charles, at the Artesian, each tub is in its own private room with a door that locks. At the Artesian, I do not hear other people’s conversations while I am soaking. At the Artesian, I get an hour of quiet, peaceful, hot water bliss. The Artesian also has at least one large tub, big enough for two (or maybe three) people. I was able to soak in the large tub once when the individual tubs were all taken. There is plenty of room to stretch out in the big tub. My last one-hour soak at the Artesian cost six dollars. The bathhouse is closed on Wednesdays. The Artesian is also an RV park, open to nightly, weekly, and monthly stays. I spent two months there in the winter of 2014. Because the Artesian has restrooms and baths, it is a perfect place for a van dweller like me to stay. The monthly rate was extremely affordable, and included WiFi access. I was also able to utilize the electric hookups to charge my laptop and phone batteries. Folks staying there pay for the electricity they use, but my usage was small and I only payed a few dollars a month for it. Also, because I was a tenant, soaks cost me just $3 an hour. I miss soaking in the wonderful, hot mineral water in T or C, especially in the winter. To find out about other places where you can soak in hot mineral water, check out the article “11 Hot Springs in New Mexico You Need to Visit” on the All The Rooms blog. Useful information, Blaize, and I like seeing pictures. I’ve hung around here for spells, but I tend to go back to the same baths because I’m familiar with them. The Artesian gets good ratings from the locals, too. Thanks for reading, Duck. I appreciate your comments, and I’m glad you like the photos. I’d always rather soak at the Artesian, but it doesn’t open as early in the morning and is closed on Wednesday, so at those times, the Charles is a nice backup. Blaise, again thank you for your delightful posts. I enjoy hearing about my beloved New Mexico from a seasoned traveler like you. Blaize, Sorry autocorrect changes the z to an s in your name. I am glad you are enjoying my T or C series. I love NM SO MUCH! Writing about it makes me miss it. Thanks for reading and commenting and no worries about the “s” instead of “z” in my name. Autocorrect has a mind of its own. Although I’ve never done it, I can sort of understand the appeal of the outdoor hot springs, open to nature, and all that. But, I’m wondering about the appeal of paying to soak in an indoor cubicle tub where thousands of other people have also soaked. Is the water that different? Tammi, thanks for reading and writing with your question. The water in T or C is that different! It is so hot (which is really nice in the winter), and I feel super relaxed when I get out of it, probably due to the heat AND all the minerals in it. 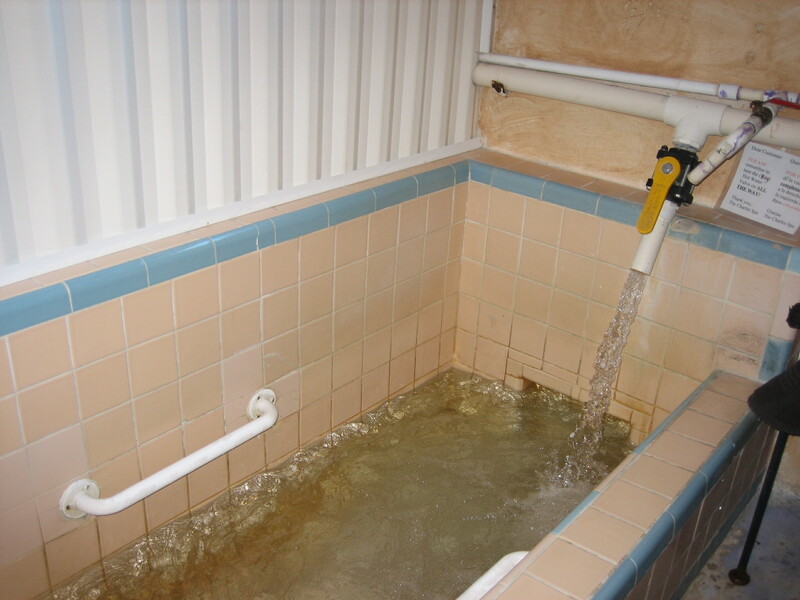 As I learned when writing one of these bathhouse posts, apparently the chloride in the water is high enough to sterilize the skin and keep germs from growing in the water. In the free-flowing pools, water does flow in and out, so it’s not like getting in the bathtub after all the other siblings have bathed in it. If you are squeamish about soaking where others have soaked before (and I can understand feeling that way), I suggest skipping the free flowing pools completely, in favor of the pools more like bathtubs, where the water is drained after each use and cleaned between soakers. Blackstone is the cleanest, newest looking place I’ve soaked. If still in doubt, ask about their cleaning policies. Or skip it altogether if it doesn’t appeal to you. I know we aren’t all into the same things. Oddly enough, the free flowing pools appeal to me more than the bathtubs. One day, I’ll give it a try! Thank you for your response. I do hope you give it a try if you are ever in T or C, Tammi. If you don’t like it, you never have to do it again, and at least you know you gave it a fair shot. Cheers! Hi Blaize. Thank you for writing this great article and we appreciate that Riverbend is included. Since your visit here was nearly two years ago, I thought I would mention that since then, we have changed our policy about talking and noise in the pools and all of the soaking areas are now Whisper Zones. We are also building 7 new riverside pools that should be completed this Spring, so please come back to try us again in the future. Thanks again! Thanks for the update on Riverbend, Jake. I think a Whisper Zone policy is a great idea. It’s good for people to know the expectation of quiet is in place. As you could probably tell by reading my post,I get really annoyed by loud chitter chatter when I am trying to relax. The chitter chatter was especially irritating at Riverbend because I was trying to take in all of the natural beauty around me. I’m happy to know y’all are addressing the issue. Thanks for reading my blog, and thanks for the comment. Thanks Blaize. I agree, and I get pretty annoyed when I’m soaking and guests don’t whisper. It is an ongoing battle and we depend on the guests to report it to us, especially in the private pools, as we can’t do constant walk-throughs. Overall, it is much improved and more relaxing than ever, but until all the guests get on board with the policy and new ambiance, it will be a bit of a challenge. Thanks again!